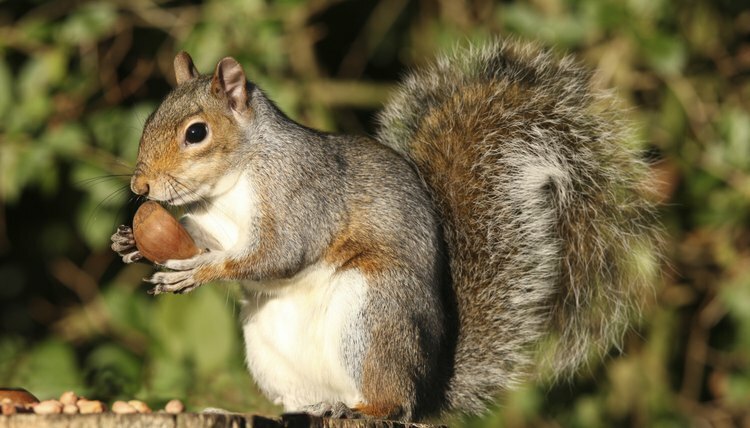 The most prevalent breed of squirrel in North America is the Eastern gray squirrel. It’s the one you see running around the park in the spring. It’s easy to tell their age based on visual clues found in pictures. If you find a baby squirrel and want to take it home, consider that it’s not legal to keep a squirrel as a pet in every state. Check the regulations where you live before you get one. 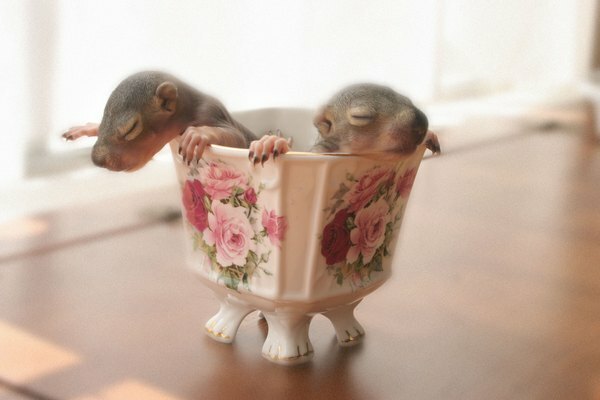 A newborn baby squirrel, up to about 5 days old, is hairless and pink. His eyes and ears are closed, and his fingers are joined. He will be about the size of a woman’s thumb. Soft fur will begin to form around his mouth and nose at 5 days old. At 1 week old, the baby squirrel’s skin starts to appear gray as his fur grows. A picture with proper coloring will show the babies as grayish pink. By 2 weeks old, his fur is sparse but starting to become evident if you look at the picture closely. His eyes are closed at this stage but you might begin to see a small slit as they begin to open. His ears begin to move away from the head and the nails and whiskers grow in at this stage of development. He won't have teeth yet, the one clue that's difficult to see in a picture unless it shows his open mouth. 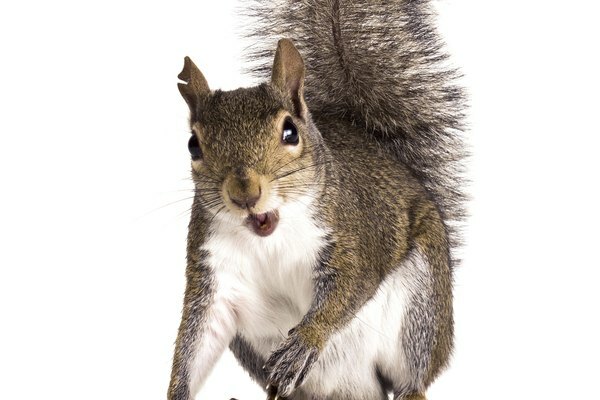 At 3 to 4 weeks old, the lower front teeth start to emerge, which you can see in a picture of the squirrel feeding or yawning. His ears begin to open and the smooth gray fur on the baby’s body continues to grow as the tail hair comes in longer. The last places to remain hairless are under the tail and on the lower legs. White fur starts to form on his belly and legs. The Eastern gray squirrel’s eyes open and his top teeth being to emerge at 5 weeks old. At this age he will be sleeping a lot and lying down or crawling on all fours rather than sitting up or climbing. Pictures of squirrels at this age usually show them sprawled out with their tails straight out behind them. At 6 to 7 weeks old, the squirrel will begin to sit up, with his tail curling over his back in a classic squirrel pose. He is fully covered with fur, and his tail starts to appear quite fluffy. At this age the baby will be much more active and spend less time sleeping. 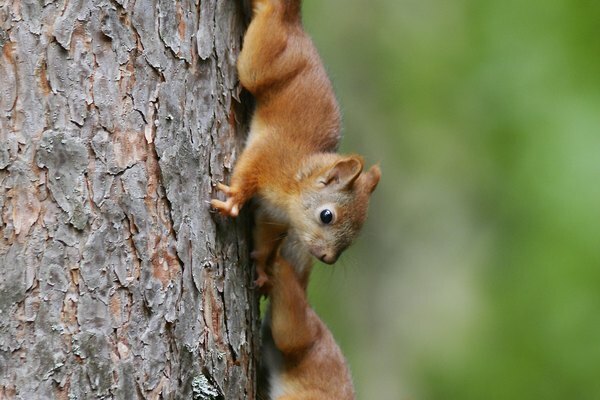 At 8 weeks old, a baby squirrel actually looks like a squirrel, albeit a small one. He becomes very active and jumpy, and uses his sharp claws for climbing and hanging upside down. By 10 weeks old his tail is full and bushy, and his sharp teeth are fully grown in.